Freds Pass Reserve is the regional hub for the community for residents from Palmerston to Darwin River. It holds the main facilities for recreation activities for people in this area. It sits adjacent to the Stuart Highway, 35km south of Darwin. Freds Pass Reserve is owned by the Litchfield Council and is leased to Freds Pass Sport and Recreation Management Board Inc.
On December 14, 1976, 13ha of Crown land at Freds Pass were annexed for use by the general public as recreation area. Since that time, additional parcels of Crown land have been added; the Reserve currently encompasses 82.75 ha. The Reserve is home to the numerous clubs and organisations that use the facilities regularly. It is also used by other casual users and the general public. 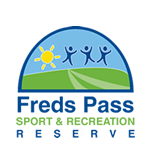 About 4,000 people use Freds Pass Reserve every week. In addition, annual events such as the Freds Pass Rural Show, Freds Pass User Groups’ Home Games, NT Bushfire Council, Volunteer Firefighter’s Firies Games, along with many smaller community and sporting events that are staged at the Reserve.